Earlier this year, AHCA/NCAL President and CEO, Governor Mark Parkinson, sounded the call for medical liability reform. Now there appears to be new evidence supporting why tort reform is needed. A new study in the New England Journal of Medicine found that high-quality nursing homes get sued almost as often as other nursing homes. According to the study, the top 10 percent of nursing homes had a 40 percent risk of being sued, while the worst 10 percent of nursing homes were only slightly higher with a 47 percent chance of being sued. The study suggests that lawsuits, or the threat of lawsuits, do not encourage nursing facilities to increase their quality of care. Reporter Jennifer Goodwin of HealthDay highlighted the report and turned to AHCA’s own director of government relations Teresa Cagnolatti. But even with bipartisan support in Congress and the backing of the President, tort reform has yet to move this year. AHCA/NCAL is supporting specific legislation to tackle medical malpractice – H.R. 5, the Help Efficient, Accessible, Low Cost, Timely Healthcare (HEALTH) Act of 2011, introduced by Phil Gingrey (R-GA). The legislation would cap non-economic damages and establish a time limit to file a claim. The measure is currently before the House Committee on Energy and Commerce. You can TAKE ACTION today by emailing your Member of Congress through AHCA/NCAL’s Advocacy Center. Let your representative know today that reforming malpractice suits can help ensure nursing homes have more resources to provide quality care. in Tucson, with her mother, Kay. There has been some interesting coverage this week about how Americans are realizing the importance of investing in long term care insurance. While federal employees are getting ready for their annual open enrollment for long term care insurance, The New York Times featured Marina Sturm, 55, who needed guidance in planning for her retirement. With the help of a certified financial planner, she was advised to get long term care insurance for herself. “In my opinion it’s essential. You can break a hip and long-term care will take care of you when medical coverage does not — same with stroke,” according to the financial planner. Meanwhile, Forbes ponders about the future of the Community Living Services and Supports (CLASS) Act. CLASS is a national, voluntary program that was a component of the 2010 Affordable Care Act which aims to move long term care services from being largely funded by Medicaid into a self-funded insurance system. But what really raised an eyebrow this week was a survey released by Prudential Financial, Inc. It found that as 71 percent of Americans are concerned about the possibility of needing extended care service, 63 percent do not have confidence to pay for it. The study also reported that many consumers overestimate the costs of long term care services and have a hard time understanding the breakdown of funding sources between private insurance, Medicare and Medicaid. For younger and middle-aged Americans, retirement planning does not always take priority. And when people actually begin to think about saving for the future, they don’t always consider their potential for long term care needs. None of us hope to take a fall or develop a debilitating disease, but as we get older, we must prepare for these possibilities. As investment researcher Morningstar points out, “your need for this type of coverage is unknowable; you're insuring yourself against a risk, not a certainty.” While long term care insurance may not fit everyone’s bill, it is a viable option for many and deserves more attention. With each passing year, more and more seniors are living longer while a large number of Baby Boomers are entering into retirement. This surge in the senior population does not mean that we can diminish the level of care they deserve to receive. But if Americans do not prepare, programs that help support elder care, Medicare and Medicaid, will be further strained. That’s why AHCA/NCAL is encouraged to see new reports that showcase Americans really taking their future health care needs into account. We’re proud to fully support the Long Term Care Partnership Program - a public-private partnership between states and private insurance companies. Through this program, we can help reduce Medicaid expenditures by delaying or eliminating the need for some people to rely on Medicaid to pay for long term care services. Therefore, investing in long term care is not only smart for many individuals and families, but more cost-effective for taxpayers. And long term care facilities benefit from not having to rely so heavily on reimbursement rates. It’s a WIN-WIN-WIN. AHCA/NCAL hopes to see this interest in long term care insurance continue to rise, as all Americans should learn more about whether this is a good option for them and their families. As implementation of the Patient Protection and Affordable Health Care Act continues over the next few years, AHCA/NCAL remains committed to working with policymakers to ensure that current and potential challenges for nursing and assisted living facilities are addressed. Many regulations still must be developed in order to put the reforms established in the law into practice. We know how important it is that providers have a voice in the development of those regulations that will impact the long term and post-acute care profession, and AHCA/NCAL is continuously striving to make sure we have a seat at the table. We’re also keeping a close watch on the need for any “technical corrections” as these regulations and other programs are developed, so that our members are not put at a disadvantage. Additionally, AHCA/NCAL is pursuing a legislative agenda that addresses other critical issues not included in health care reform, including a close look at Medicaid funding. Meanwhile, we realize that understanding the many facets and complexities of the Affordable Care Act can seem daunting. So AHCA/NCAL is also working diligently to supply our members with the best available information regarding what the law means for the profession through easy to understand materials and webinars. Check out AHCA/NCAL’s dedicated webpage regarding health care reform not only to access our Affordable Care Act resources, but also to learn more about our role in implementation. Because AHCA/NCAL understands that it’s more than just reaching milestones-- it’s about reaching results. To let us know how we can do more, contact us directly or share your thoughts with us in the comments section below. The U.S. Department of Labor (DOL) today announced its release of the Long-Term Care, Supports and Services Competency Model. The purpose of the model is to promote an understanding of the skill sets and competencies that are essential to educate and train a competitive long term care workforce. AHCA/NCAL was a major partner in working with DOL to identify and group the core competencies required of long term care workers, along with the U.S. Department of Health and Human Services, the Paraprofessional Healthcare Institute, the National Alliance for Direct Support Professionals and other expert organizations. The competency model website for long term care includes an interactive building block image to make it easy for providers to understand how certain skill sets “fit” with others. Retrieved from http://www.careonestop.org/competencymodel on 3/21/11. 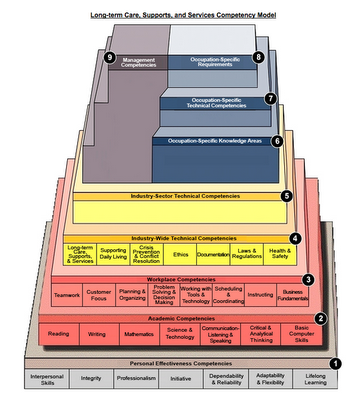 Clicking on any of the higher levels will display a robust profile of competencies by occupation. The profiles include everything from work styles and values, to tools and technology used on the job. The detailed section of each occupation profile features a ranking of job tasks by importance and salary information. As America’s baby boomer population continues to age, their needs continue to diversify. The competency model is useful in highlighting the academic, workplace and technical skills needed to meet this challenge, and highlight transferable skills that can be applied across the spectrum of long term care. To learn more about the competency model and how you can use it, check out the DOL’s online podcast. This week, the Environmental Protection Agency (EPA) launched a new ENERGY STAR Senior Care website for long term care facilities. Different than most websites that promote being “green” with simple ideas, this site includes a resources for nursing homes, assisted living communities and other facilities to benchmark, improve and communicate energy performance. The Portfolio Manager is particularly useful to providers. Its interactive functionality allows for tracking and assessing energy and water consumption in a secure online environment. Want to get benchmarking pronto? ENERGY STAR has created a starter kit just for that purpose. Benchmarking is just the beginning. You can also estimate your facility’s carbon footprint, set your investment priorities with a cost-comparison tool for water and energy and verify your “green” progress with a customized Statement of Energy Performance. Want to learn more? Follow ENERGY STAR on Twitter and Facebook for real-time updates. As providers continue to grapple with implementation of the latest version of the Minimum Data Set (MDS 3.0)–the federal government’s required questionnaire on patient assessment, which helps determine Medicaid reimbursement rates–we continue to provide posts from experts in the field. Today’s guest post features insight from Steve Herron, director of business development for Resource Systems, and David Rokes, chief operating officer for Post Acute Consulting. The Minimum Data Set (MDS) 3.0 and the new skilled nursing facility payment system resource utilization group IV (RUG-IV) ushered in a new era of change in the long term care world. Although this may cause some anxiety for providers, the best way to respond is to take steps now to ensure proper documentation and accurate data in 2 areas: Activities of Daily Living (ADLs) and pre-admission documentation. Under MDS 3.0 and RUG-IV, the categories of “Late Loss” ADLs that affect reimbursement are unchanged; however, the methodology for scoring on the ADL index has been altered. As a result, many residents are expected to generate a lower ADL score under RUG-IV as compared to the previous RUG-III reimbursement system. For example, under RUG-III, the Reduced Physical Functioning category was the only group that broke the ADL index into five different “end-splits” that were reflected as A through E in the score. RUG-IV now has four such categories with five ADL end-splits. From an operational perspective, this change introduces 15 new opportunities for a one-point documentation error that could cause a resident to drop into a lower end-split, meaning that it is much more likely that a missed ADL opportunity will cause a facility to get reimbursed at a lower rate than is appropriate. To illustrate, under RUG-III, missing one ADL end-split meant losing, on average, approximately $20 per day. In contrast, under RUG-IV that average jumps to more than $34 per day. That’s more than a 50 percent increase in the value of one missed ADL point. Over time, miscoded assessments could also lead to residents receiving care plans that are inadequate for their needs. Pre-admission documentation is another area that deserves attention. MDS 3.0 did away with the elimination of a look-back period, which means that facilities can no longer “look back” for most services delivered outside of the skilled nursing facility to establish acuity and appropriate reimbursement. This reinforces the importance of immediately capturing services delivered inside the walls of the facility, especially services such as ADLs and mood and behavior, which have historically been under-coded. It is also important to leverage technology that enables facilities to capture more accurate and timely ADL data. Since the MDS focuses on activities that happen three or more times at a given level over the course of seven days, it is essential to use an electronic system where information can be added multiple times throughout a shift. While the transition to MDS 3.0 and RUG-IV may represent the greatest challenge since the prospective payment system was implemented, it can be done successfully. Providers should stay positive and focus on capturing accurate and timely by educating employees and leveraging technological advancements. In conjunction with the 3rd Annual AHCA/NCAL Quality Symposium, Provider magazine hosted its first-ever roundtable on health information technology (HIT). The discussion focused on how long term and post-acute care professionals are utilizing HIT to improve operations and quality care at facilities. Representatives from a wide variety of companies participated, including Kindred Healthcare, Covenant Care, and Marquis Companies. Participants discussed 3 major areas, including how to best use HIT in a health reform-driven environment; the role of HIT in capturing true, point-of-care documentation; and planning for the future. The roundtable was sponsored by AccuNurse. Larry Wolf, health IT strategist for Kindred Healthcare, shared his thoughts on the event and the human aspect of implementing HIT in long term care. Check out all the video clips from the roundtable on our YouTube stream, and be sure to view photos on our Flickr page. Even though the roundtable is over, the discussion doesn’t have to be. Amid tight state Medicaid budgets, increasingly complex patients and a post-health reform environment, how is your community making the most out of HIT? Share your thoughts with us below. Today AHCA/NCAL announced that David R. Gifford, MD, MPH, will serve as the association’s senior vice president of quality and regulatory affairs. 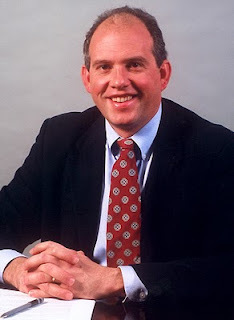 Beginning May 2011, Dr. Gifford will head a new, enhanced department that oversees quality initiatives like Quality First, Keeping the Promise and the AHCA/NCAL National Quality Awards Program. Dr. Gifford’s new position reflects AHCA/NCAL’s commitment to helping members advance their quality goals, including the provision of high quality, person-centered care. A seasoned public health veteran and clinician, Gifford has devoted much of his career to the nursing home profession as a board-certified geriatrician and medical director. Since 2005, he has served as the Director of the Rhode Island State Department of Health, where he led efforts to revamp the nursing home survey process to promote resident centered models of care. As Chief Medical Officer for Quality Partners of Rhode Island, he directed CMS’ national nursing home-based quality improvement effort. He currently serves as council chair for the National Quality Forum’s Public & Community Health Council and is a member of the National Commission on Prevention Priorities. To learn more about Dr. Gifford and his work, download his complete biography.